The new Busy Bees Patchwork workshop programme will be out soon! We have an exciting array of classes to suit all abilities in Patchwork, quilting, mixed media, hand embroidery and much more! We pride ourselves on finding the very best of local talented tutors to inspire, and help further your creative knowledge without being too expensive! Many of our tutors have been teaching for many years, but we also like to help those who are new to teaching and give them a chance to show what they can do and also inspire them on their journey as teachers too! Everyone knows how therapeutic making and crafting is, it's also about community and making new friends. It's about being with others who understand how important it is to be creative, we love to purchase our goodies, sit and admire them, plan the next project and generally drool over the lovely fabrics, threads, papers and mixed media products that are out there today. So much at our fingertips but then comes what do i do with them? A class (like no other), a good teacher can help you on your way, and hopefully even complete a project in a day where time allows. Being part of that community of people feels rewarding, our happy place where nothing else in the world matters, you can let your worries fly out the window for a short while and only concentrate on making something beautiful. It's a feel good thing, putting your brain to good use, we can loose ourselves and dream of what we will attempt next, invisage what it will be like, what fabrics to use, what threads and who will benefit from your craft. A present for Grandma, a gift for the new baby in the family, a big smile on your sisters face when she knows how much love and effort it must have took to make such a wonderful gift. All this and more comes from being creative and taking a class with others means you can share and inspire your fellow class mates, it's like belonging to a secret society. 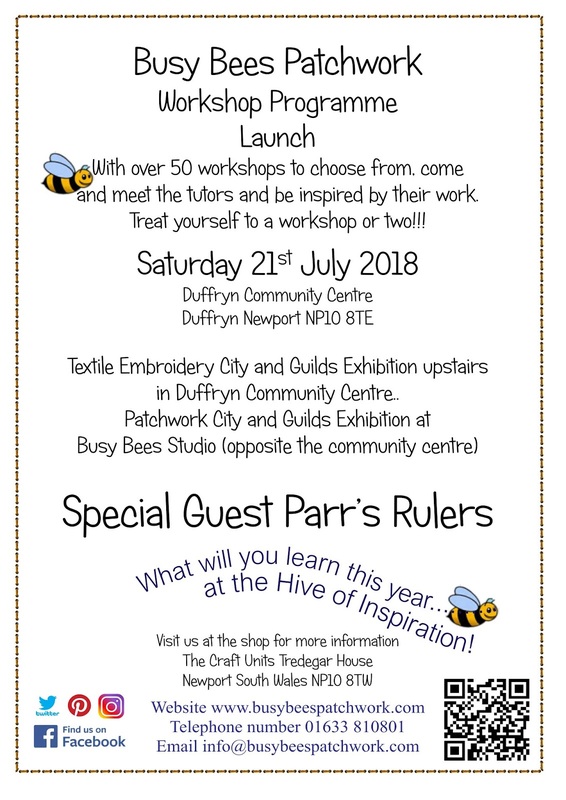 This year we are thrilled to have Parr's Rulers demonstrating for us on the day, their innovation to help you quilt is being recognised the world over! They have recently teamed up with Create and Craft and had very successful show some weeks ago. They have also agreed to teach for us in the new programme, so if you have purchased rulers and would like some extra tuition, book onto their class and learn how to be more confident in using this amazing system. I know I am going to have a go for sure! Looking forward to seeing you on the day, the city and Guilds girls have nearly completed all they need to do for level 1 and will be exhibiting their work for you to see and admire, they have worked so hard as have the Patchwork girls too! Pop along and see us you can't fail to be inspired by all the lovely work that will be on display. 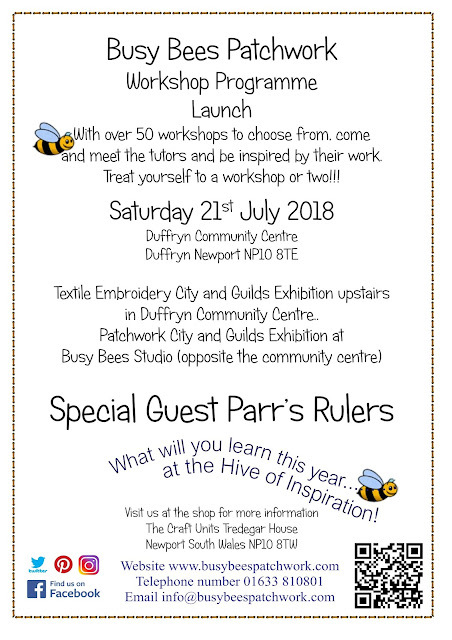 What will you learn this year at the "Hive of Inspiration"
P.S Now taking names for level 1 City and Guilds 7161 textiles hand and machine embroidery.